One of the most important tanks ever released to the vape community was Uwell’s very first Crown Sub-Ohm Tank. The original Crown tank was revolutionary for its time, laying the groundwork for future sub-ohm tanks and raising the expectations for sub-ohm vaping around the world. After their massive success with the Crown tank, Uwell took a gamble and redesigned the coils for their second rendition of the Crown tank, the Crown II. The Crown II was received with less fervor than it’s predecessor promoting a revamped conical coil design that offered four smaller-sized wicking ports and three airflow holes that were built into the coil’s bottom contact. The end result of the Crown II left a majority of the vape community feeling disenchanted, so Uwell went back to the drawing board and redesigned the Crown from the ground up in an attempt to recreate the magic that went into the original. The Crown 3 Sub-Ohm Tank experienced a complete design overhaul while maintaining the sleek and eye-catching finish that went into the first two designs. The visually-appealing Crown 3 features a Stainless Steel/Quartz Glass construction and measures at 24.5mm in diameter. The new-and-improved threaded top cap design features sleek machine-cut grooves for additional grip and can be removed effortlessly for easy access to the dual 3.5mm x 6mm top-filling fill ports. The Crown 3 Sub-Ohm tank promotes a completely leak-free design due to its locking center-chamber and requires a Uwell key or flathead screwdriver to fully disassemble or replace the glass (key included). 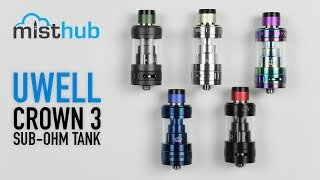 Aside from its aesthetically pleasing design, perhaps the most impressive feature of the Crown 3 is the new threadless “Plug and Pull” coil system that Uwell has implemented. Unlike the original Crown or the Crown II, the Crown 3 features a new SUS316 Parallel Coil design that slides effortlessly into the tank. These new coils are significantly larger than Uwell’s previous atomizer heads and can handle significantly higher wattages than the previous coils. Additionally, Uwell ditched the circular wicking port construction of the Crown II and went with a design that offered more wicking surface-area for faster wicking times and higher vapor output. The Crown 3 caters to the cloud chuckers right out of the box, arriving with a 0.25 ohm SUS316 Parallel Coil pre-installed (rated at 80-90W). Uwell also includes a 0.5 ohm replacement SUS316 Parallel Coil (rated at 70-80W) for anyone that’s looking to get the most flavor out of their favorite e-juice. The Crown 3 also features three fixed adjustable airflow inlets that can be opened or closed at the users discretion to fine-tune their vaping experience to meet their exact airflow preferences. If you’re looking for an attractive top-filling tank that harnesses some of the most impressive atomizer head technology today, Uwell’s Crown 3 will help elevate your overall flavor experience and make your device look remarkable in the process!